Philippine Homeschool Conference, a gathering full of information and inspiration for people who want to learn more about homeschooling, are just starting out, or want to improve their homeschooling experience. The conference – specifically by way of its Expo – is also a venue where homeschoolers (and even non-homeschoolers!) can look at and purchase materials, plus get to know more about services and programs that may aid them in their homeschooling. HAPI is indeed happy that the Philippine Homeschool Conference (PHC) has become the yearly “cannot-be-missed” event of homeschoolers in the Philippines. Parents who have attended previous conferences will agree that it is something definitely worth going to. This is the inspiration behind the theme of this year’s Philippine Homeschool Conference: “Homeschool to the Future: Educating for the World of Tomorrow.” As in previous years, the conference aims to encourage and equip homeschooling families in their journey through practical breakout sessions, the expo filled with educational materials, and by providing a venue where homeschoolers can meet and gather as a community. The PHC 2017 will take place from 7 a.m. (start of registration) to 6 p.m. on October 7, 2017 at Treston International College in Bonifacio Global City, Taguig. Treston is an institution that openly supports and accepts homeschooling, and HAPI is grateful for their partnership for this year’s Conference. Bearing the theme in mind, the Conference’s line-up of speakers includes international and local speakers who are a mixture of experienced homeschoolers and passionate advocates of homeschooling and education. The PHC 2017 Expo is also sure to delight any homeschooler (or any parent who is intentional with their children’s education for that matter) with its offerings of products and services that can help them provide their kids with a rich learning experience. This year’s conference topics have the good old “basics” of educating one’s children in mind, while also helping them to prepare for the future. The topics were also prepared with different kinds of parents in mind: those curious about homeschooling; those just starting their journey; those who are already homeschooling; and even those who are attracted to homeschooling but can’t do it for some reason or another, yet still want to be hands-on with their children’s education. We live in a fast-paced, instant-gratification world, but there are age-old, universal values that parents need to impart to their children. Sen. Francis Pangilinan, a champion of homeschoolers and author of Resolution 308 declaring March 3 as National Homeschool Day, will share the wisdom he gained from raising his own brood of this new generation of Filipinos. Just like homeschooling, Efren Peñaflorida Jr.’s acclaimed project called “Kariton Klasrum” is as unconventional as education goes. This 2009 CNN Hero of the Year awardee and 2016 CNN Superhero of the Decade finalist will inspire homeschoolers to continue their journey of this road-less-travelled way of teaching as he shares real stories of how his out-of-the-box method of education has changed the lives of families, one student at a time. After 17 years homeschooling her 2 children and speaking at several Great Homeschool Convention workshops in the U.S., Marissa shares why we need to “C-A-R-E” about our children’s education and the surprising rewards that come toward the end of your homeschooling journey. Besides being what many would consider a “veteran homeschooler,” Marissa is also an Emmy-award winning broadcaster, Great Homeschool Convention speaker, narrator for Apologia books, and founder of www.TheHomeschoolRevolution.com. In addition to these inspiring and information-packed keynotes, every conference attendee will definitely find something “fit” for their unique homeschooling situation in the practical Breakout Sessions lined up for the conference. Participants may choose two of the topics for the Breakout Sessions. There will also be a special session on the topic “The 21st Century Learner,” to be given by guest speaker Sheryl Genuino-See, M.A., an educator, motivational speaker, and award-winning social entrepreneur. 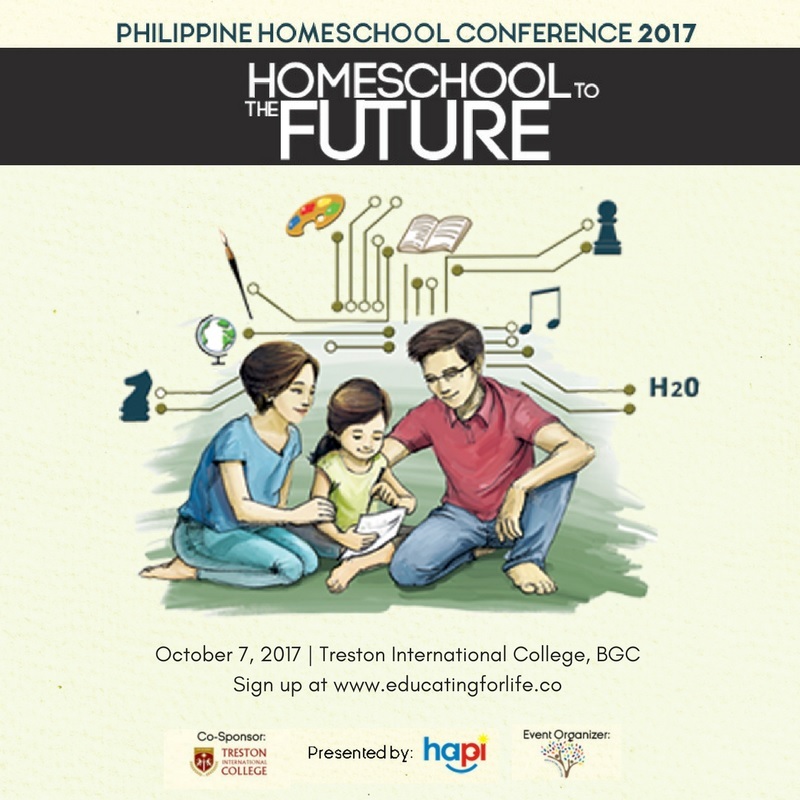 For inspiring keynote talks by well-known homeschooling and education advocates, practical, information-packed breakout sessions, and access to the PHC 2017 Expo filled with vendors servicing the homeschooling community (and families in general), the conference’s Early Bird Rate of P800 per head is definitely a steal. Children 4 years old and above who will be joining their parents all throughout the talks and sessions pay P800 per head (but again, this Early Bird Rate applies only until Sept. 30, after which the Walk-In Rate of P1,000 per head applies). Parents can also opt to have their children join the Children’s Activities in designated areas for a fee per activity. * (Details of these activities will be posted soon on educatingforlife.co) *IMPORTANT: For safety and security, children need to be under the supervision of a trusted adult companion at all times.